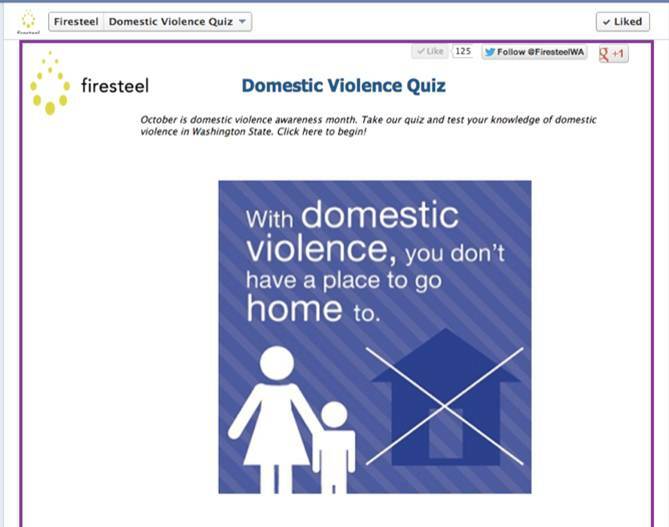 October is National Domestic Violence Awareness month and Firesteel is exploring the connections between domestic violence and family homelessness. 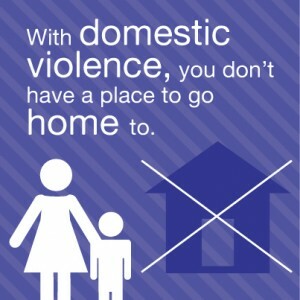 Domestic violence creates an unstable environment and without a sense of safety, you can also lose the sense of home. The picture below is one of three images we created as part of our Facebook domestic violence awareness campaign. Upon leaving an abusive relationship, a woman may have nowhere to go. Approximately 63% of homeless women have experienced domestic violence in their adult lives (National Law Center on Homelessness and Poverty). Domestic violence shelters in the Seattle area are often full and have to turn women and children away. Sadly, I’m sure this is not unique to the Seattle region. Social issues are often considered in isolation–domestic violence and homelessness are often two separate conversations. So let’s talk about the relationship between these two issues more and raise awareness of how they connect. We decided to talk about it over social media through a simple Facebook campaign. A domestic violence awareness campaign is nothing new, but one specifically targeted to Facebook is a new twist. We created a series of graphics and share one image each October Monday morning, in hopes that the images will be shared and raise awareness. The image shown above was edited to be our primary image across social media channels, including Facebook, Google+, and Twitter. The third image below is to the point! In addition to graphics, we created an interactive Facebook quiz. Again, I turned to experts to help inform the content including coworkers here at the YWCA and a Firesteel advisor from a Salvation Army domestic violence housing program. They encouraged me to highlight the connection between economic abuse and homelessness but I don’t want to say much more about it, because I’m asking you to take the QUIZ and don’t want to spoil it! The quiz is available through the end of October. The closer we come to ending domestic violence, the closer we are to ending family homelessness. So let’s keep talking about it online and offline.